Sub tuum praesidium confugimus, sancta Dei Genitrix. Nostras deprecationes ne despicias in necessitatibus. 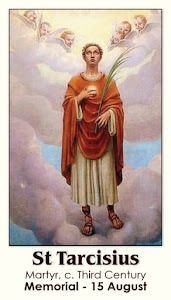 Sed a periculis cunctis libera nos semper, Virgo gloriosa et benedicta. We fly to thy protection O Holy Mother of God. Despise not our prayers in our necessities, but save us from all dangers. O ever glorious and blessed Virgin. πὸ τὴν σὴν εὐσπλαγχνίαν, καταφεύγομεν, Θεοτόκε. Τὰς ἡμῶν ἱκεσίας, μὴ παρίδῃς ἐν περιστάσει, ἀλλ᾽ ἐκ κινδύνων λύτρωσαι ἡμᾶς, μόνη Ἁγνή, μόνη εὐλογημένη. 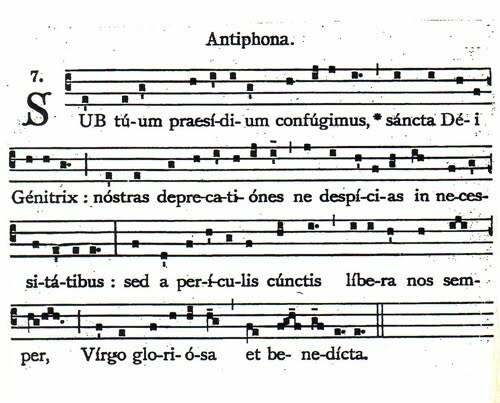 The Sub Tuum praesidium is, without question, one of the most ancient hymns, having been dated to the mid Third Century in its Greek form, which is given above. The Latin version is comparatively recent, dating to the 11th century - about the time of the Battle of Hastings. 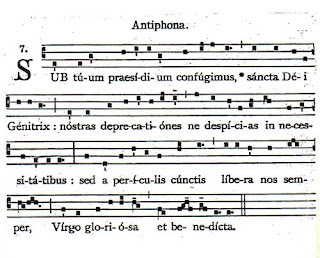 It is used in the Roman Liturgy as the antiphon at Compline in the Little Office of Our Lady. It is also in the Raccolta, and is often added to Litanies of Our Lady. It's well worth learning by heart.